The Hyundai Elantra has made huge strides throughout its lengthy history, quickly becoming one of Canada’s best-selling cars. 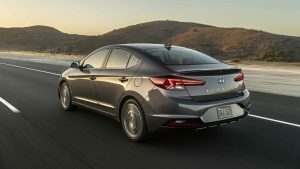 With its strong value proposition, long list of features, and, at times, interesting design language, the Elantra had enough going for it to come within striking distance of the top-selling Honda Civic for a period of time. Although that objective seems to be something of a pipe dream at this point, the Elantra continues to strive and deliver on what it has always done best. The Elantra sedan has typically been a fairly conservative choice in terms of design. The latest model, however, makes use of some pretty interesting design details in order to help it stand out. The wedge-shaped angular headlights have an aggressive look to them and the lighting itself has some fairly intricate detailing. The interior is quite conventional looking with standard-grade materials and build quality for an affordably-priced car. Overall space is about average for the class, though a pair of adults will be able to manage just fine in the rear seats if necessary. One of the most noteworthy traits of the Elantra is the approachability and ease of use of its interior layout. Many cars today can feel overwhelming with their complicated infotainment systems and lack of traditional controls, but not so in the Elantra. The touchscreen is easy to master with a clean look and a straightforward menu structure. It is also compatible with Apple Carplay and Android Auto. Below the screen are simple buttons and knobs for controlling common audio and climate control functions that don’t require any kind of serious learning curve. 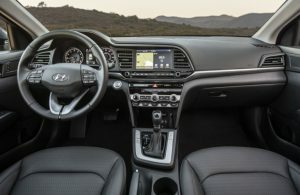 It’s an impressively straightforward setup, especially given the fact that the Elantra can be equipped with all the latest features and technology that consumers have come to expect. Driving the Elantra isn’t a particularly exciting experience, but it is pleasurable enough. There is nothing offensive or spectacular about the way it drives, yet it is an easy car to take over long distances and live with on a day to day basis. The ride is comfortable enough to smooth out rougher road surfaces, yet taut enough to take a corner without fuss. For those looking for a bit more excitement, the Elantra Sport upgrades the standard model’s simple torsion beam rear suspension for a more sophisticated multilink arrangement for better handling. Sport models also get a 201 horsepower 1.6L turbocharged engine, a standard 6-speed manual gearbox, and a throatier exhaust note for more spirited performance. Extra power is always nice, but the standard model moves along just fine thanks to a naturally-aspirated 2.0L 4-cylinder engine which produces 147 horsepower and 132 lb-ft of torque. A 6-speed manual is standard, though most models come with a 6-speed automatic transmission. In addition to providing an adequate amount of power and refinement, this setup provides respectable fuel economy figures of around 9.0L/100km in the city and up to 6.5L/100km on the highway. Fans of well-proven technology will also appreciate the simplicity of the Elantra’s naturally-aspirated engine and conventional transmission in place of complicated turbos or CVTs. Hyundai’s have traditionally been well known for their high value factor, and in this respect, the Elantra appears to be a true standout. The entry-level Essential model starts at $16,999 and includes features such as air conditioning, heated seats, and Bluetooth. 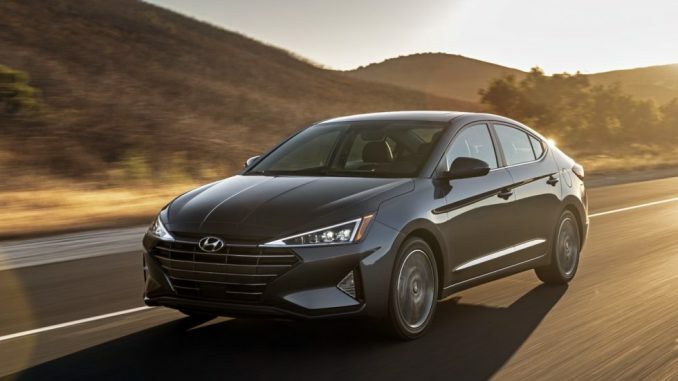 For only $1,700 more, buyers can add the automatic transmission and cruise control, making the Elantra the least expensive compact car to offer these essential features. For $21,949, the Preferred with Sun & Safety Package appears to be the sweet spot in the range adding features like blind-spot monitoring with rear cross-traffic alert, a heated steering wheel, proximity keyless entry, sunroof, hands-free smart trunk, and forward collision-avoidance assist. Unlike some rivals, Hyundai requires you to stretch to the $27,399 top of the range Ultimate model for additional safety features like lane keep assist and adaptive cruise control. There are many excellent options to consider when shopping for a compact sedan, including the Honda Civic, Toyota Corolla, and Mazda 3. The Hyundai Elantra will appeal to those who prioritize ease of use and saving money above all else. The no nonsense interior and conventional drivetrain are a refreshing nod to simplicity. The high number of features for a lower price point than competitors helps validate its undeniable value, and that’s before factoring in Hyundai’s frequent use of purchase incentives. A strong record for reliability and an industry-leading 5 year or 100,000km comprehensive warranty help to give it an edge as well. All things considered, the Elantra makes a strong case for itself as a worthy alternative to the best the segment has to offer.